After years of playing sports, numerous falls and injuries had taken their toll. I was in my early twenties, but suffered with low back pain daily. Every night when I would lay in bed, my back hurt until I finally fell asleep. I just assumed this would be something I would have to live with for the rest of my life. By chance, my mother worked for a dermatologist that shared a professional complex with several other doctors. One was a chiropractor named Victor Fitch. My mother had met him and thought he seemed nice. She told him of my interest in healthcare. He told her I was welcome to visit his office to meet him and learn about chiropractic. Boy am I glad I listened to my mom! After watching in amazement as Dr. Fitch helped person after person with various problems, he asked if I would like to be checked. I told him I didn’t really have any problems, but sure. I never even thought to mention my back pain! That night, much to my amazement, my back didn’t hurt. It almost seemed odd to me. Could years of pain really be gone? I was convinced. I knew then I wanted to be a chiropractor and help others get relief and live more enjoyable lives. 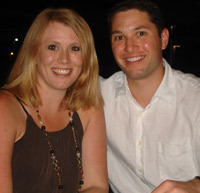 I thought so much of chiropractic, I decided to marry a fellow student at Logan College of Chiropractic in St. Louis. Dr. Lori and I met as I was finishing and she was practically starting chiropractic school. I moved to Birmingham to be close to family, and she joined me after graduation. Who says long distance relationships don’t last! Today, Dr. Lori and I are proud to serve the Mountain Brook community. 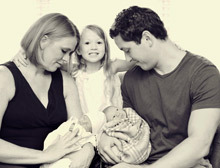 In 2007 our amazing daughter Lauren was born. What a blessing she was, and how incredibly fortunate did we feel to be able to start adjusting her soon after her birth. Birth can be very stressful on an infant’s spine, and we were glad we had very gentle ways to remove that stress from her tiny spine. When our twin boys were born in 2012, we felt full in more ways than one. All of our children get adjusted regularly, and are rarely sick. We also all love to spend as much time together as possible, including exercising, reading, and enjoying time outdoors. Thanks for visiting our site and your interest in our office. Give our Mountain Brook office a call, or click here to email us to find out if we can help with your health challenge. I look forward to meeting you!